IELTS Speaking Test: 3 Things You Need to Know Now! Are you stressed about the IELTS Speaking test? Are you worried that you are going to panic? Are you afraid that you will forget everything you learned in your IELTS preparation? Are you afraid that you won’t know the answer? We understand how you feel so today in today’s post we’ll give you three key things that you need to know about the IELTS Speaking test to get the score you need. One of the most efficient and smart ways to increase your Speaking score is to use native-like vocabulary including phrasal verbs, idioms, and expressions. When you prepare for IELTS get a list of the common Speaking test topics and learn a few phrasal verbs for each topic. You don’t need to memorize a random list of phrasal verbs. Make sure they are related to test topics. Next, practice those phrasal verbs in everyday conversations with native speakers. Also, practice them when you do your Speaking test practice with your IELTS professional teacher or coach. You need to interact with these phrasal verbs in many ways and many times before the test. Practice writing in your journal and use them in your writing. Notice them in the material that you read. Give yourself plenty of time to learn a group of phrasal verbs for each topic and by the time you get to the test you will be ready to use them in your answers. You can also try using Anki to learn new IELTS vocabulary. If you use phrasal verbs you will get a 7 or higher on the vocabulary section of your Speaking test. Learn more about how to use phrasal verbs on the Speaking test here! Many IELTS student think that you need to speak fast to get a higher score on IELTS Speaking. If you speak fast and the examiner can’t understand you or if you speak fast and make a lot of mistakes you won’t get the score you need. Instead, you need to slow down and use intonation in your voice. Put some feeling behind your words. This will push your fluency score up and your pronunciation score. It’s more important to speak clearly and with confidence than it is to speak fast. This is also true for everyday English fluency but it’s especially important on the IELTS. Click here to learn more about how to use your intonation on the Speaking test. Do you know what steps to follow to get a 7 or higher on IELTS? Get our step-by-step IELTS Cheat Sheet. 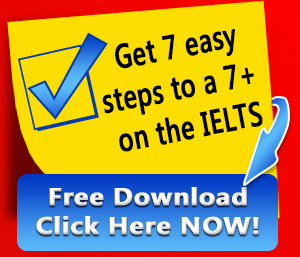 Download the “7 Easy Steps to a 7 or Higher on IELTS” now! Everyone’s biggest fear is that they will get into the Speaking test and they’ll get an unfamiliar question. Are you worried about that happening to you? What should you do if you the examiner asks you a question and you don’t know the answer? The most important thing to remember is that you are not graded on your ideas on IELTS. You are graded on your ability to articulate your ideas and communicate in English. You can make something up- it is totally ok to make up a fake answer. Again, no one is going to go and check your facts. This is not a history test or a test about your factual knowledge. If you make something up and you communicate your message well, you can easily get a 7 or higher. This is much better than freezing up if you don’t know the answer and saying nothing. Also remember that you can’t ask the examiner to give you a different question. You have to answer the question that you are given. Click here to learn more about what to do if you don’t know the answer on the Speaking test. What questions do you have about the IELTS Speaking test?